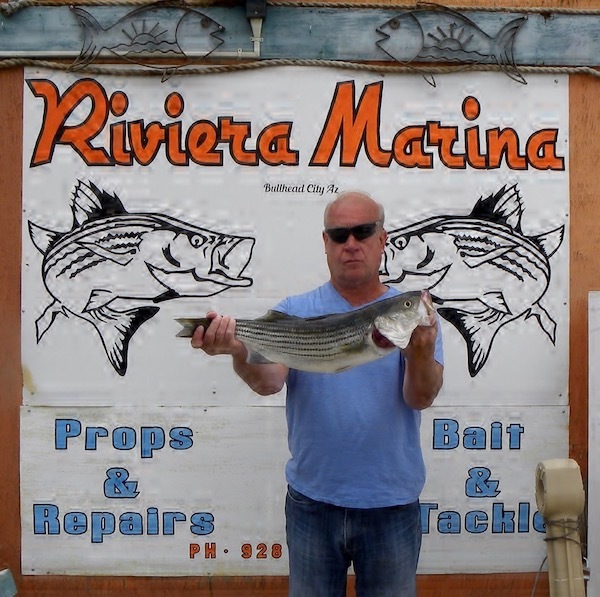 Mike Andrews with his 5.66 pound striper that was 26 and 5/8 inches long. We are having a super trout bite going on. It is especially helpful that or federal hatchery, The Willow Beach Hatchery, is getting us some great rainbow trout. The stocking sites are Davis Camp and Community park, this should be our last week of this seasons trout plant. The good news is that we are getting a lot of fish. Our local anglers are having some success landing their limit of 5 rainbows. Local anglers Johnny Krall and Mike Merritt are seen together with their catch, they were using power bait and Mike had his favorite spinner that produced his limit. 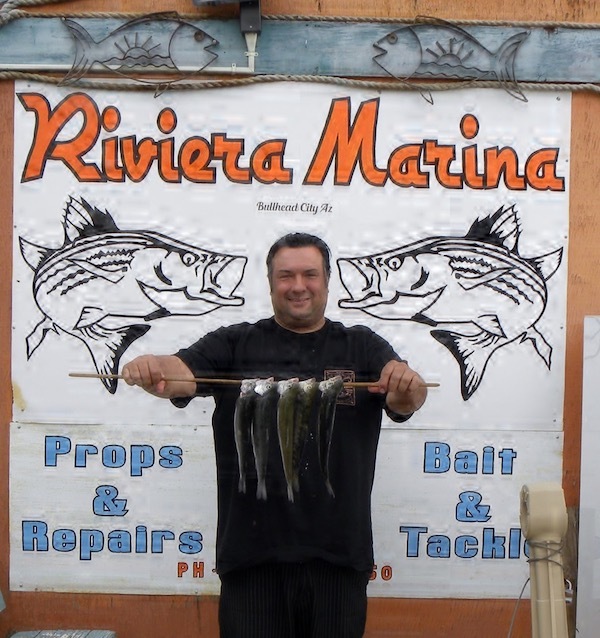 Also fishing from shore, in the community park area, was Mike Savoia. These are some great examples of some of the rainbow trout that are hatchery is getting to us. A big shout out and thanks goes to those involved in the raising of these fish for our community. The striper bite here along the Colorado river below the Davis dam is picking up. 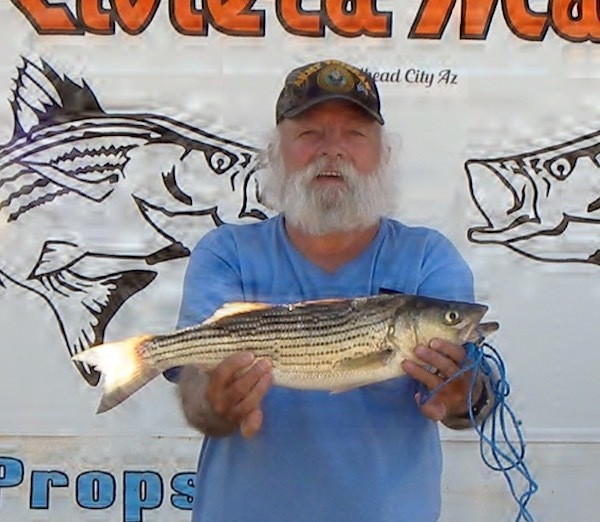 Mike Andrews brought in a 5.66 pound striper at 26 and 5/8 inches. He was fishing from shore using a bomber long he just purchased. 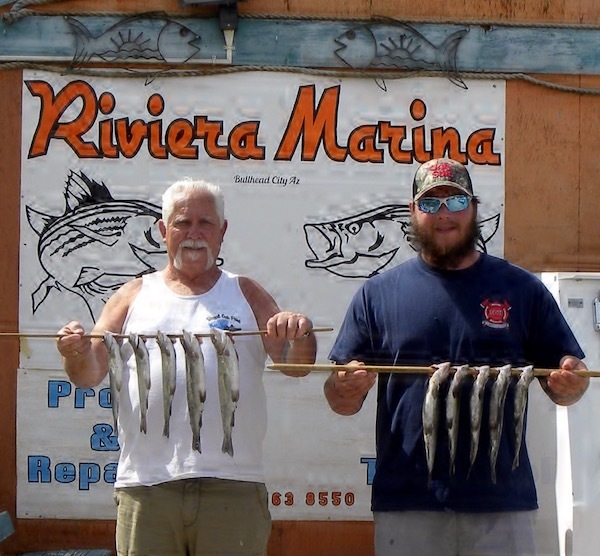 The stripers are mostly running in the 1 to 3 pound range with a few larger ones in the mix. This means a good knot and a good line best in the 12 pound range, so set that drag to not break the fish off. 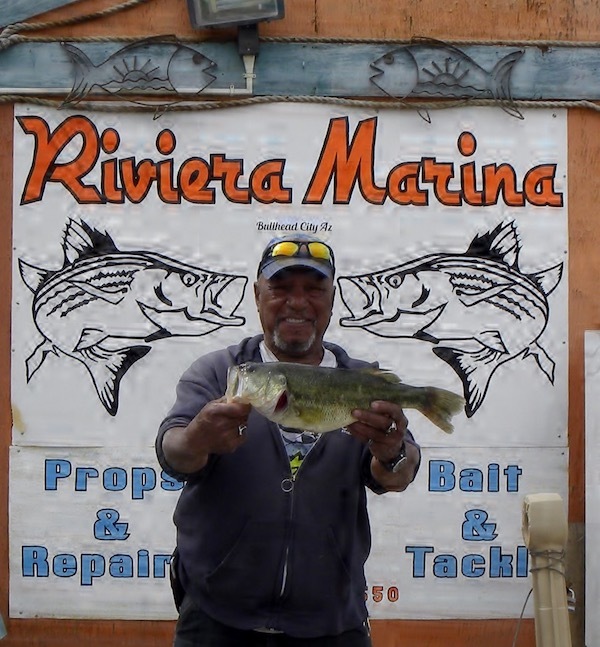 Up on Lake Mohave our stripper bite hasn’t taken off yet the large mouth and small mouth bass should be on the nest or close to that time. It’s a good practice to release these as they are guarding the nest from predators like the carp for example so the eggs aren’t devoured. Mike Savoia Limits on Trout for the day.